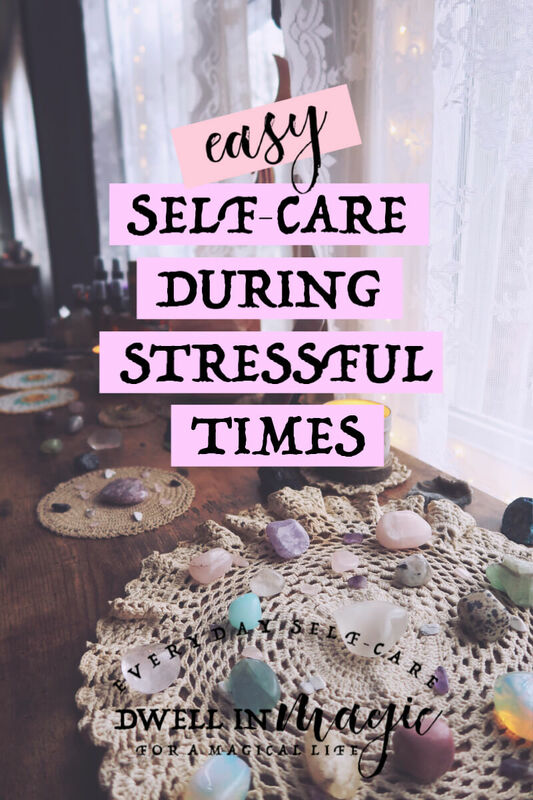 Self-care can feel much easier when life itself is going easier, but what about times when you’re busy or going through a stressful period? What about the holiday months, when you’ve got errands and engagements to attend back to back? In this article I’ll share some tips on how you can easily fit in self-care during these times that will help you to breathe a little better and feel reset. Holidays or not, I get a lot of readers asking for self-care tips for busy lifestyles. Some people are busy all the time. Other times we get into busier seasons of our lives or go through stressful events and self-care seems to go out the window. Unfortunately, it’s during these times that self-care is so crucial! One myth I’d like to dispel before I begin is that self-care doesn’t have to be a long, drawn out process. Self-care needs to be sprinkled throughout your day, with you honoring where you’re at and giving yourself what you need to the best of your ability. So many people put self-care off until they have “time” because they have a vision of what self-care “needs” to look like, but that time doesn’t come and they find themselves hitting rock bottom emotionally, physically, mentally and spiritually. You don’t have to let yourself get to that place. Change your perception of self-care (the one that society says is face masks and expensive spa trips). Let go of your perfectionism (self-care is a long list of must-do’s that I need to check off or else it wasn’t self-care). Shift into a mindset that self-care is the smalls things–the quiet, still moments here and there that you can take for yourself to bring yourself back into alignment. Here are some quick, easy self-care ideas for those times when life feels too overwhelming to fit in self-care. When life is swirling around you and things are coming at you back to back, simply ask yourself what do I need in this moment? Usually my first response to that question when I’m stressed is something like “I need a damn drink.” So, I hear ya! But stay with the question past your first sarcastic answer. Is it a shower? To go to bed early? Take a breather? Ask for help? Take a technology break? Clean your space? No matter where you are, there are ways to find a moment of reprieve. You just have to get creative. At work, I used to go into the bathroom for the silence or go on a walk around the building. At home with kids I would close the blinds and put on their favorite movie. And no matter where I am, a snack and some water usually helps! You can always find small ways in the midst of chaos to honor what you’re needing. So ask yourself this question frequently and try to honor it as best you can in the moment. One of my favorite ways to make self-care easy and consistent is to create a self-care basket kept in a convenient place. Mine sits in the living room since I’m in there a lot. 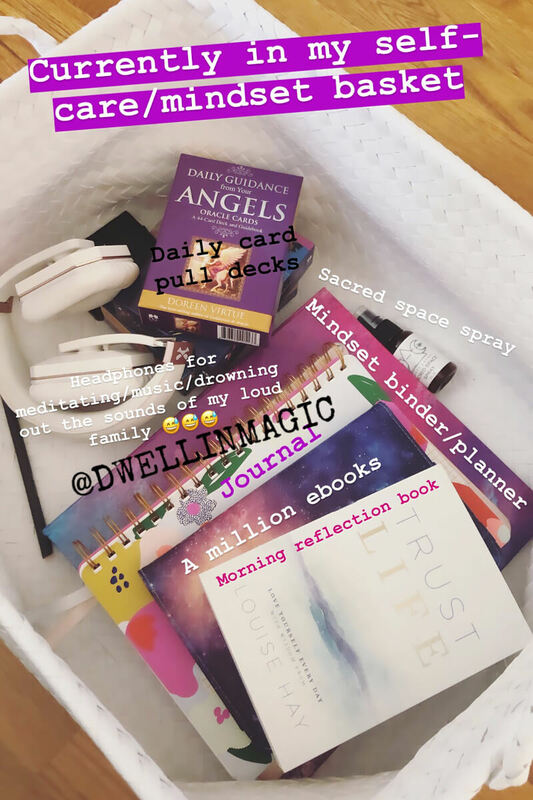 I’ve basically got my mindset binder, journal, tablet for ebooks, daily book for a short read, headphones, oracles cards, and sacred spray. The spray can instantly turn my little recliner chair into what feels like sacred space and I love having these items that I can easily pull out if I find myself with a free moment. I wrote an article here sharing what’s in my moon binder which is similar to my mindset one. I only have two binders, I swear! They both essentially hold my self-care and mindset worksheets in them, which you can find in my shop. Your bedroom is your reprieve from the world and it really helps when you treat it as such. When I’m going to have a crazy day, one of my favorite things to do is to prepare my room for when I get back. I get the bed ready–not made–but ready for me to slip into. Get the sheets untangled and straightened but then pull them back halfway like you’re about to get into bed. Fluff the pillows and arrange them nicely. I pick up stuff around my room, I’ll even quickly dust with a tissue or a sock I’m about to put in the hamper anyway…quick cleaning! When I get back home, I’ll turn on the string lights I have in my bedroom so the lighting is low and spritz my bed with some sort of essential oil spray, like a sage or lavender, to help the space feel cleared and soothing. I cannot tell you what a difference this makes for me to be able to come back after a hectic day with a bedroom that is clean and waiting for me. Most of us are busy but all of us have to bathe! Which means we’re spending about 10-20 minutes in the bathroom every day. Turn those 10-20 minutes into a detoxing session, and by detoxing I mean detoxing emotionally and mentally. I also have string lights in my bathroom and a little oil warmer light for the extra lighting. I never ever use overhead lighting when I take my showers and I swear it was also a game changer for me. Throughout the day we pick up and carry with us the emotions of others. We’re constantly stimulated by bright lights and constant noise. When you bathe it’s a chance to de-stimulate yourself from the day (if you bathe at night). The other thing I do while in the shower is listen to something on my phone, like a podcast that helps to realign me or something on YouTube that inspires me. There are lots of self-care podcasts (I’ve got one coming for ya!) and one of my favorite people to listen to on YouTube is Abraham Hicks. De-stimulate your mind and body, and spend that time taking in good stuff that helps to shift your energy and mood. 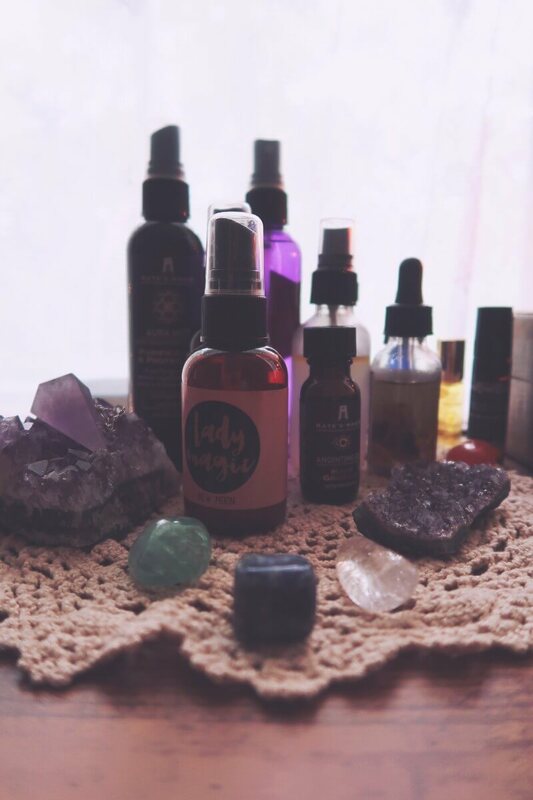 I absolutely love essential oil sprays and crystal jewelry because they are the ultimate self-care on-the-go items. My essential oil collection I’ve mostly gotten from a monthly spiritual box I receive called Goddess Provisions. That’s where I’ve also collected a lot of my little crystal jewelry items too actually. I have an onyx bracelet that I like to wear when I go out. Onyx is a very grounding, energy protecting stone. Even if you don’t believe in the energy of stones, it serves as a reminder of how you intend to feel. Every time I’m in a social situation, I’ll touch the bracelet and be reminded that I’m grounded, calm and safe. As I mentioned spritzing my bed with essential oil sprays, I also love spritzing myself throughout the day as a pick-me-up. They’re easy to keep in a purse and you can also get essential oil roll-ons. Those are even better when you’re not at home because you can just roll them onto your wrists. Again, I also get these in my monthly box from Goddess Provisions that I linked above. I hope I’ve given you some good ideas for easy self-care when life is hectic or hard. Or for during the holidays, because I think that counts for both! I can easily find myself busy and stressed this time of year. It really helps to keep self-care easy and accessible by doing small things for myself throughout the day. Let me know how you incorporate self-care during the busy times of life–I’d love to hear some new ideas! If you’d like my new 2019 Moon Calendar and to stay updated on new self-care blog posts, trade me your email and I’ll send you some goodies. 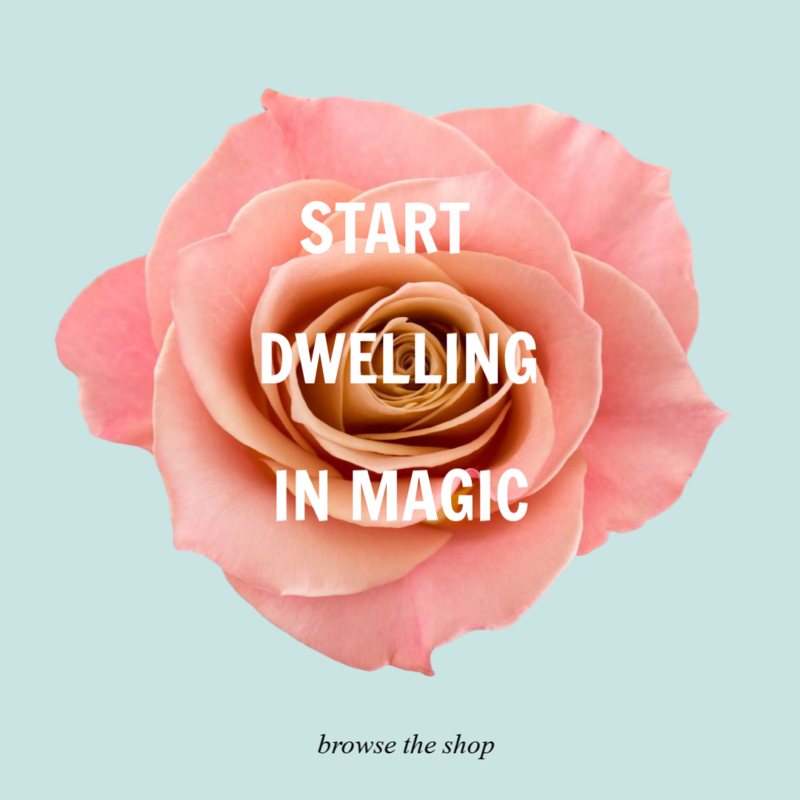 Come join the Dwell in Magic Facebook group for more weekly self-care inspiration, and hop over on Instagram for a peek into my self-care routines and rituals on my Insta stories. I am purchasing the Manafesting with the Moon but am interested in how you set up your Mindset binder /planner. As the New Year approaches please consider sharing with us how we can set one of these up for ourselves. I love the idea of a self care basket! 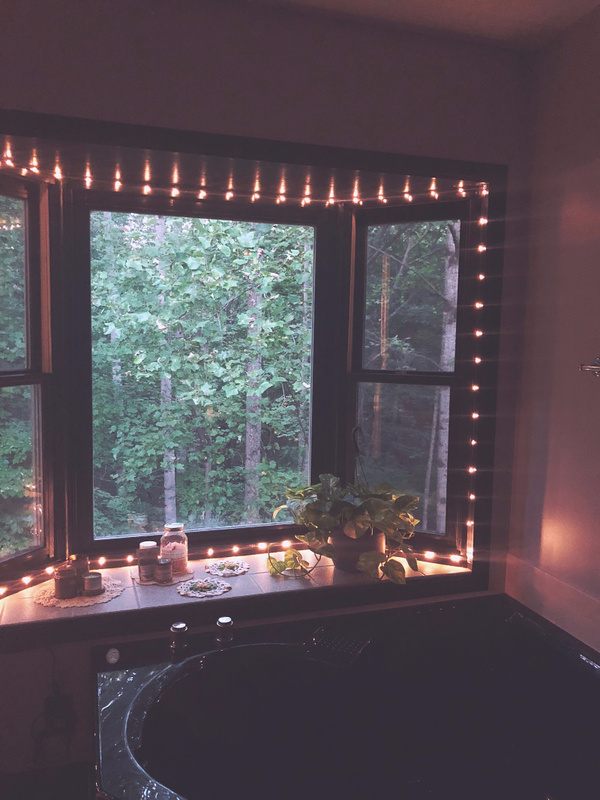 And I’m obsessed with the fairy lights in your bedroom and bathroom!